Fundamentals of Acoustic Signal Processing serves as an introduction to the previously published book The Nature and Technology of Acoustic Space. As a comprehensive, introductory text to modern acousticsand signal processing, it will be invaluable to students, researchers, and practitioners in industry. 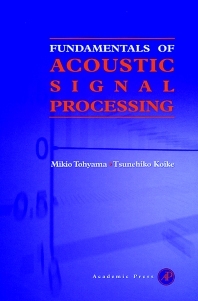 The book provides the fundamentals of acoustic wave theories as well as discrete signal processing. The authors have concentrated on the fundamental issues which they use in lecture courses, seminars, research, and development activities. From wave equations to discrete signal analysis, the treatment is self-contained with numerous helpful illustrations and examples. The relationship between continuous and discrete sampled data is clearly interpreted, and the origin of the sample data is readily comprehensible. Both students and engineers can reorganize their fundamental knowledge about signal processing.
. Emphasis on the relationship between continuous and discrete signal representations.
. High calibre data and figures. As a comprehensive, introductory textbook to modern acoustics and signal processing, this book will be essential to students, researchers and practitioners in industry. Undergraduates and graduates in engineering, mechanical engineering, acoustics engineering and physics. Engineers in the automotive industry, transport, aerospace, heavy machinery, and engines. Aimed at practitioners and researchers who need to grasp the fundamentals of signal processing quickly in order to develop applications in acoustic engineering. Introduction. Discrete Expression of Signals. z-Transform. Transfer Function and Frequency Response Function of Linear Systems. Discrete Fourier Transform. Transfer Function Models and Wave Equations. Statistical Models for Acoustical Transfer Functions. Deconvolution and Inverse Filters. Linear Equations, Inverse Filters, and Signal Analysis. Index. Dr. Mikio Tohyama teaches undergraduate and graduate courses at Kogakuin University, Tokyo, Japan. His research covers acoustics and speech signal processing. Tsunehiko Koike works at the Speech and Acoustic Technology Center, NTT Advanced Technology Corporation. His research interests include speech and acoustic signal processing.